'Funky House Anthems Vol 1' perfectly captures that Don Diablo style sound that's been rocking dancefloors and festival stages. Each of the five Construction Kits features an intense piano break, ultra energetic buildup elements and a high octane drop. If wobble basslines and genre experimentation is your bag, this is the Producer Loops collection for you. This high energy library of on-point Construction Kits, fuses skippy, accessible hooks and melodies with razor-sharp production. Packed full of heavy synths, incredibly tight drums and flawless production, this pack is sure to inspire your next House hit. 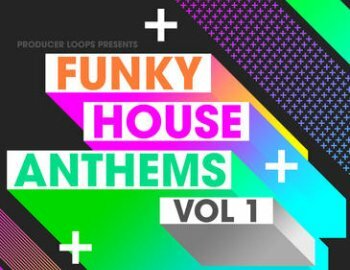 From intense buzzing synths and quirky FX to soaring risers and funky top loops, 'Funky House Anthems Vol 1' boasts a unique and distinctive sound backed up by hard-edged production.